Siquijor has the distinction of being the mystical island of the Philippines, a name the province may have earned through numerous tales of supernatural superstitions that originated here. I don’t know if it helped that Siquijor rhymes with horror. But this province has always been at the forefront of conversations when it comes to sorcerers, witches and other mythical creatures that would lure you to their place for you to never come home again. My father even expressed concern when I told him I would go to Siquijor. I was there to shoot an episode for GMA News TV’s Tripinas with its hosts Solenn Heussaff and Stephen Tagud. He told me not to drink tap water anywhere or any beverage that was manually prepared, not to roam around alone especially in barrios and not to have eye contact or stay too long with locals. These thriller tales have become the real ghosts of Siquijor, stories that would never disappear even if the local government would spend a fortune trying to exorcise them away. The reputation of Siquijor as a melting pot of everything that’s creepy has become its calling card, for better or for worse. I didn’t believe any of these stories, especially because I really love traveling to places I haven’t been to. But I admit that when the ship finally stopped in Siquijor, I promised myself I’d still be cautious. Solenn Heussaff, host of Tripinas. Watch it on GMA News TV every Saturdays, 11am. We traveled in the wee hours of the morning. Dark clouds hovered over Siquijor. It was drizzling and then it rained. The fear of the unknown ominously lingered in me like a creepy shadow. Yet everything changed as we got off the ship. The locals and tourism officers of Siquijor gave us a warm welcome. Along the way, we saw balete trees that were probably centuries old and forests that seemed untouched; yet I didn’t feel anything eerie about it. Our first stop was a café and restaurant on top of a hill. We were served breakfast and I didn’t mind that we were drinking a fruit punch that was surely just mixed and made in that restaurant. The place had an overlooking view of nearby provinces such as Cebu and Bohol. For our next destination, we had to travel into the heart of the woods where we would meet a bolo-bolo healer — a person who, according to locals, has the power to heal different illnesses by using a wooden tube, a stone, and a glass of water. His name is Guillermo Yungod and he has been doing folk healing in the barrio for two decades. He would put water in the glass and place the stone inside it, then he would use the wooden tube to blow the water. He didn’t know how to speak Tagalog so people who come to see him just point to the affected parts of their body that they want Mang Guillermo to heal. According to the tourism officer, when dirt would come out from the tube and manifest on the water, this means the dirt from the body is being removed, and thus would result in healing. Sometimes, even insects would even come out. That freaked me out. Nonetheless, I still gave it a try. We believe what we want to believe. That’s me with a bolo-bolo healer. For our third destination, we had to descend one hundred thirty five slippery stone steps to reach Cambugahay Falls. The waterfalls consist of cascading streams of clear water originating from natural springs. The water plunges to about three to four kilometers downwards, making numerous wonderful swimming lagoons for visitors and tourists. Aside from swimming and taking photos, tourists can swing on ropes like Tarzan. We then went to Salagdoong Beach. To reach the shore, we passed through a man-made molave forest. Others would’ve freaked out if they had to navigate this labyrinth of lush greens. But with the sun peeking through the branches of the trees, it was rather relaxing than frightening. Our hosts, especially Solenn, loved the beach. The sand was smooth and can compete with Boracay or Palawan. The water was clear and a mix of green and blue. Aside from the scenic view, visitors can also do picnics and cliff jumping at the beach. As we left the province, I realized if there was anything supernatural or enchanted about Siquijor, it must be its picturesque gifts from nature. I never encountered any lurking ghost or any demonic being. 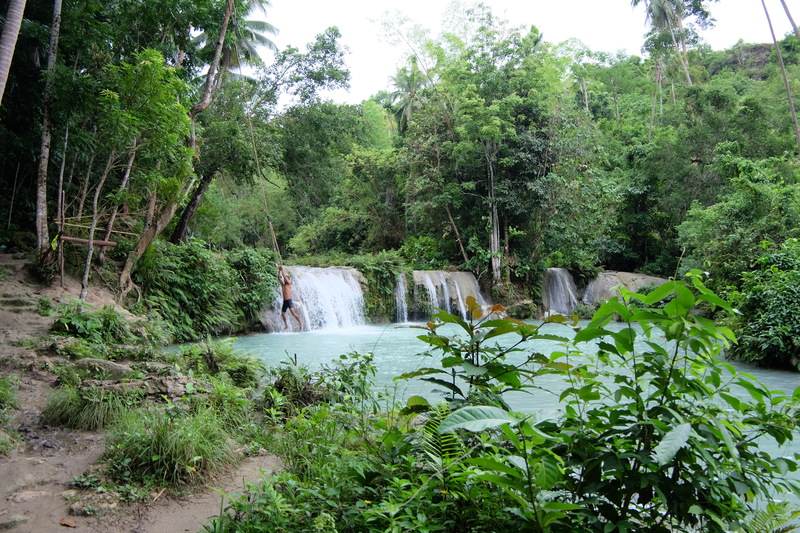 With many people fearing the place, Siquijor may have become one of the best kept secrets in the Philippines as a travel destination for its tranquil tourist spots and hidden gems. Apple Gamboa was an interview and field producer for GMA News, particularly the newscasts Quick Response Team and News to Go. She is currently a producer for lifestyle TV shows and documentaries. Travelling and music are her passions and she takes risks as her personal reality medicine. Journalism 2010, UST. Read more of her articles here.